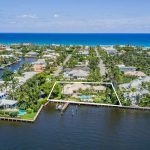 The stunning coastal property located at 1215 Crestwood Drive, Delray Beach is less than one block from the ocean complete with private beach access. 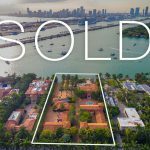 Situated on an expansive parcel with 154 feet of frontage and 103 feet of depth, the property is just north of Atlantic Avenue’s shops and eateries. Completely rebuilt in 2011 and in like-new condition with designer finishes, the residence boasts over 4,400 total square feet and offers open floor plan with stunning views of the pool and grounds, spacious chef’s kitchen open to the family room, four bedrooms including new VIP suite addition, and several spots for outdoor entertaining including pool with spa, covered loggia and front courtyard with outdoor fireplace. The location is second-to-none for enjoying South Florida’s luxury lifestyle. Meticulously maintained and in pristine condition, this beach area property offers a superb location just steps from the private beach access, a few blocks from East Atlantic Avenue and a pleasant drive along A1A to Palm Beach’s Worth Avenue, Boca Raton’s Mizner Park and Fort Lauderdale’s Las Olas Boulevard. Traveling is easy with several private jetports and three international airports nearby via Federal Highway or Interstate 95. 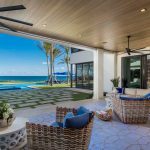 Completely rebuilt in 2011 to the highest of standards with custom finishes and designer touches throughout, the residence offers a casual elegance that sets the tone for any occasion from festive entertaining to private retreats. 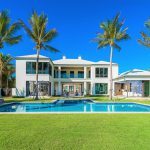 Situated on an expansive parcel with 154 feet of frontage and 103 feet of depth, the property is graced with exceptional curb appeal thanks to the manicured landscape and architectural style of the home. The brick paver walkway leads to the front porch and double glass door entry. The open floor plan is enhanced by the wood cypress paneled ceilings throughout and picturesque views of the grounds and pool with spa. The living room has built-ins and is open to the dining area with two full walls of sliders and French doors that open to the patio and covered loggia for inviting the outdoors in. The spacious chef’s kitchen has marble countertops, lots of custom cabinets, large island, top-of-the-line Monogram appliances, wine cooler, wet bar and plenty of room for breakfast area and snack bar seating on the family room side of the countertop. The family room has sliders to the pool and another private brick terrace on the west side of the property. The private master wing is on the east side of the house with French doors to the covered loggia, large walk-in closet and master bath with dual sinks, jetted tub and walk-in glass shower. The VIP suite is on the west side of the house thanks to a recent addition and features a private access to a walking path, walk-in closet and full bath with dual sinks, Jacuzzi tub and glass walk-in shower. There are two additional guest bedrooms with French doors to the front courtyard with outdoor fireplace. The property was designed to maximize outdoor living and entertaining. The interior offers access to brick walking paths around the property and many windows and sliders provide lovely views of the grounds, pool with spa and outdoor fireplace with patio. The pool with spa invites endless hours of sun and fun with plenty of room for lounging and a covered loggia outdoor living area. Pack a picnic and head to the beach with ease thanks to the private beach access less than a block away. The front courtyard has an outdoor fireplace with ample space for enjoying South Florida’s pleasant evenings. Additional features include marble and wood floors, impact windows and doors, laundry room, two-car garage, security system with cameras and large private fenced parcel with lots of green spaces. 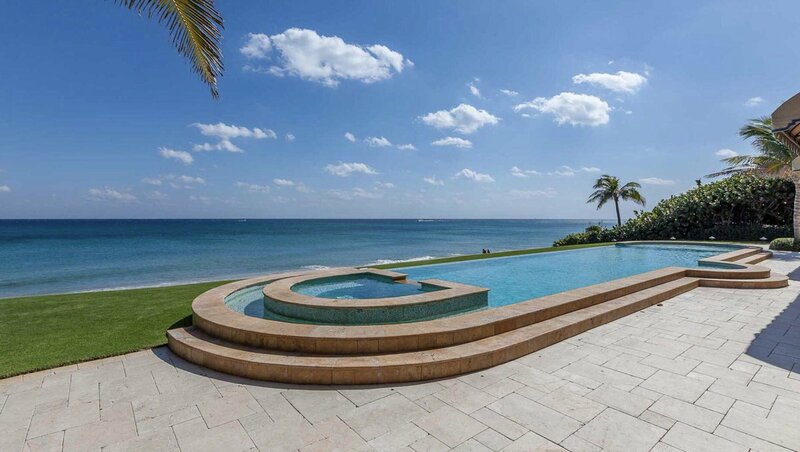 This stunning beach area home is the perfect spot to enjoy South Florida’s luxury lifestyle. Contact Nicholas Malinosky to make an offer on 1215 Crestwood Dr, Delray Beach.